Officials from NOAA's Hawaiian Islands Humpback Whale National Marine Sanctuary and the Marine Mammal Response Network, responding to a report of an ailing humpback whale on Monday (Nov. 13, 2006) off the Kailua-Kona area of the Big Island, captured dramatic photographs of a tiger shark attack on a humpback whale that eventually resulted in the endangered marine mammal's death. An estimated 25 sharks participated in the attack. Hawaii Department of Land and Natural Resources Fisheries Technician Kosta Stamoulis took these remarkable photos by placing an underwater camera on a pole under the water with support from Sanctuary Marine Conservation Coordinator Justin Viezbicke. Click here for a high resolution version of this photo. IMPORTANT: DISPLAY OF THE PHOTO CREDIT, INCLUDING PERMIT NUMBER INFORMATION IS REQUIRED FOR ALL USE OF THE PHOTOGRAPHS. PHOTO CREDIT: KOSTA STAMOULIS, NOAA NMFS PERMIT # 932-1489-08. Viezbicke and officials from the State of Hawaii were operating under state and federal permits issued through the National Marine Mammal Health and Stranding Response Program, coordinated locally by NOAA Fisheries Pacific Islands Regional Office. 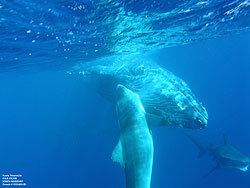 Humpback whales are protected both as marine mammals and as listed endangered species. Federal laws prohibit anyone from approaching within 100 yards of a whale in waters around Hawaii with violators of the law subject to both civil and criminal prosecution, including fines up to $50,000 per violation. Sanctuary officials reported that there appeared to have been violations of the 100-yard approach rule on several occasions during the response, including people entering the water during the attack, and that state and federal authorities may investigate. They also noted that little could have been done to save the animal. "Shark attacks are part of the natural world in which these animals live," said Viezbicke. "To them an ailing marine mammal is a meal and what happened was a natural process within the marine world." Following the year-old mammal's death, its carcass was towed and tied to a fish buoy approximately three miles off shore. Officials returned the next day to find the remains gone. 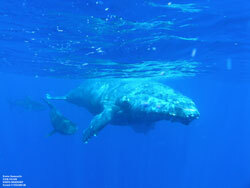 For more information: Justin Viezbicke, Hawaiian Humpback Whale National Marine Sanctuary, 808-327-3697. IMPORTANT: DISPLAY OF THE PHOTO CREDIT, INCLUDING PERMIT NUMBER INFORMATION IS REQUIRED FOR ALL USE OF THE PHOTOGRAPHS. PHOTO CREDIT: KOSTA STAMOULIS, NOAA NMFS PERMIT # 932-1489-08.